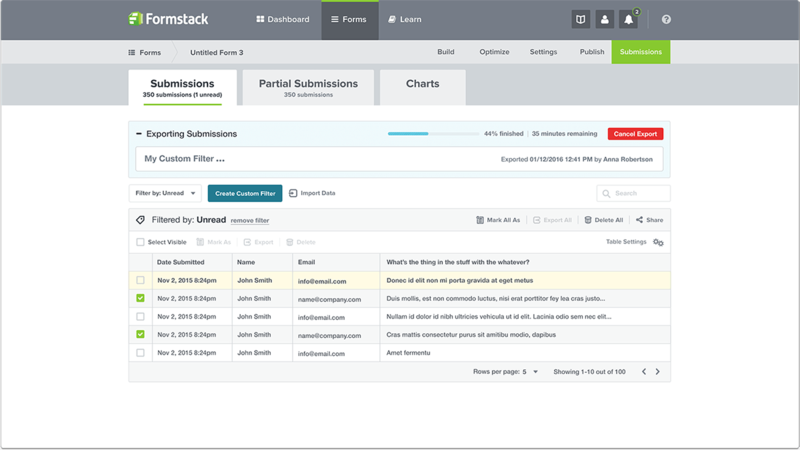 Share and collaborate on your form data with Formstack's flexible data import and export tools. Simplify the way you manage and share information with Formstack's versatile data import and export options. Import data and store it in Formstack's secure database, share data with others through email or via a simple link, or export it to an outside format for easy analysis. No matter where your information needs to go, Formstack lets you import and export data with ease. Want to control the look of your exported PDFs? Check out the Advanced PDFs feature. With this tool, you can easily customize the layout of your PDF files, tweak fields to ensure only needed data is visible, and easily share edited PDFs with others. Add logos to the top of your PDFs to make them look branded and professional. Show or hide field categories to only display information that’s relevant to your users. Easily share your PDFs by attaching them to your notification and confirmation emails. See our File Upload feature in action during a free, 14-day trial. You can also demo our form builder to get started.